Watching Durham Bulls Baseball: Bulls Lose Both; Montgomery? The headline for these two games are the Bulls being no-hit in a game that was played out on two different days (24 July and 11 August) and two different places (Durham and Rochester); and the grand slam by rehabbing Wil Myers. I lean toward the Democrat & Chronicle as the best story on the no-hitter. I'll let the Rays bloggers wax poetic over Mr. Myers. Don't get me wrong, it was a pretty shot. Just wish a few more Bulls could get on base and score. We are obsessed with the fact that the last time the Bulls were 3 games over .500 was back on April 11, 9 games into the season. At that moment they were 6-3 and climbing upwards, never to look back — until now. While worrying about that, let me ask the question: What happened to Mike Montgomery? He was to be the star of the Durham Bulls pitching staff this year. He certainly started out that way with 7 wins in 14 appearances, including a no-hitter. But beginning in late June/early July things haven’t looked all that good. In seven appearances, five have been very weak, including 4 losses, two no-decisions, and only one win. In those seven starts he’s only gone a total of 26.2 innings, and has given up 21 runs. Plus, he’s been working really hard for those outs. Last night, for example, it took him 73 pitches to get through just 2⅔ innings. At a far-distant guess there is something afoot. We noted a couple of long breaks back in June where he only made two starts in the second half of the month (6/14, 6/23, 7/5). He’s up to almost 1,800 pitches this year, slightly below average for this year’s starting pitchers, but that’s a near-pointless metric in the minor leagues. I would not be surprised to see him shut down again sooner rather than later. Have to think that something’s not quite right. Meanwhile, Bulls hitting has not improved. Two more games since yesterday’s chart (4 games in two days has to be some kind of record as well). I had to change the scale on the left of the chart since the Bulls had not had a game this year where they were below .200. "We are obsessed with the fact that the last time this year the Bulls were just 3 games over .500 it was back on April 11, 9 games into the season." The last time this year? I had to read that sentence like 10 times. Aaaaaargh! Thank you! Where was my copy editor when I needed her? What copy editor? Will go fix it. Just delete "this year" and it makes sense, sort of. With a couple more edits. Again, thanks. If the Bulls get swept in Rochester, they'll be at .500 yet still have a big lead in the IL South. They are just fortunate not to be in the IL North, where their record would put them in 5th place. Added to that, the IL South team with the next-best-record is 1.5 games worse than any team in the other 2 divisions. That tells you that even the record the Bulls have isn't as impressive considering they play more games against the IL South. 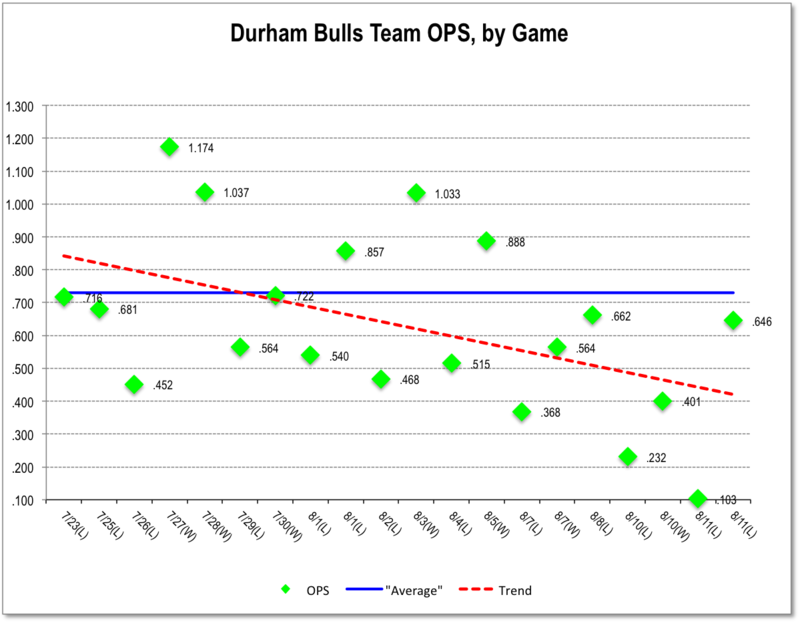 Unless something changes drastically with the Bulls' hitting of late, I'd be surprised if Durham makes it out of the first round. I'd be delighted to be wrong, of course. Having trouble commenting on my own blog! I hope you're wrong too, but it's not looking good. Team performance too much like 2012 to suit me, even if the reasons are different. Couple of roster moves today. Maybe that will help. Getting a pitcher from Montgomery (Cory Burns) and Beckham is back. Price off to "Hudson Valley" with Doug Mathis.